In some ways, disaster preparedness and immediate response are the same for all people, regardless of special needs. Please review the materials elsewhere on this website about general preparedness and response. Identify a personal support network. Organize a network that includes your home, school, workplace, volunteer site, and any other places where you spend a lot of time. Members of your network can be roommates, relatives, neighbors, friends, and co-workers. They should be people you trust and who can check to see if you need assistance. They should know your capabilities and needs, and be able to provide help within minutes. Include a minimum of three people in your network for each location where you regularly spend a lot of time since people work different shifts, take vacations and are not always available. 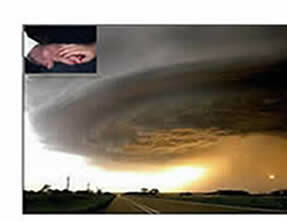 Make a personal disaster preparedness assessment. Decide what you will be able to do for yourself and what assistance you may need before, during and after a disaster. Make a list of your personal needs and your resources for meeting them in a disaster environment. Consider personal care and equipment, transportation and mobility and evacuation needs, and needs of service animals. Get informed by contacting your local emergency management office or American Red Cross Chapter to gather information about community hazards, disaster plans, and warning systems. Ask about special assistance programs available in the event of an emergency. Many communities ask people with a disability to register, usually with the local fire or police department, or the local emergency management office so needed help can be provided quickly in an emergency. Let your personal care attendant know you have registered, and with whom. If you are electric-dependent, be sure to register with your local utility company. Make a personal disaster plan(PDF) that includes information about your special needs and how they would relate to your ability to respond to a disaster. Consult with caregivers and with disability-specific agencies (see “additional resources” below) as necessary in your planning.